. @CorbinMcGuire3 buries one into a wide open net after a couple chances. UW has a two-goal lead with just over four minutes left in 2nd. PPG, Wisconsin. McGuire makes it a 4-2 game. 4:01 to play in the second. All Badgers right now as Ford has a chance from close range stopped. Crowd is into it. Wisconsin is absolutely dominating this period. 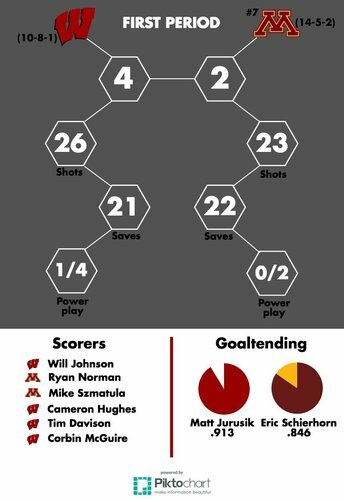 Minnesota was leading in shots 22-14 at one point. It's now 23-22. #Badgers playing with confidence now. Fourth-liners Cavallini and Soleway get assists on McGuire's power-play goal on a play off the faceoff. Malone denied on a breakaway. I think the Kohl Center ice crew tilted the ice. Schierhorn stops Malone on a breakaway try. Went for the five hold but Schierhorn closed it. #Gophers will have a PK as Bristedt is called for slashing. 15.4 seconds remain in the period. 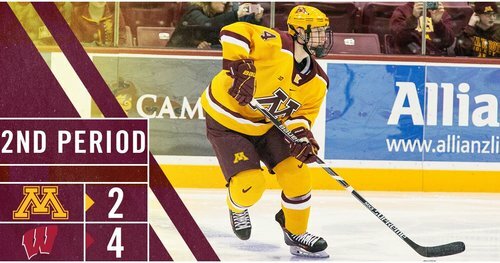 Minnesota's Bristedt goes off for slashing with 15.4 seconds left in the second. Another power play for Wisconsin. Gophers take a slashing minor with 16 seconds left in the period. It's 4-2 UW. END 2: Wisconsin leads Minnesota 4-2 after goals by Hughes, Davison and McGuire. End 2. 4-2 #Badgers . Crowd loving it. Three goals in the second improves the Badgers' national-leading 2nd-period scoring average to 1.6 per game. An assist on Corbin McGuire's goal was Aidan Cavallini's first collegiate power-play point. He now has 7 points in 69 games for UW. Badgers and Gophers out for the final period. Badgers lead 4-2 and will have 1:45 of power play time to begin the frame. Third period has begun. Will be interesting to see if the #Badgers hang on or have a let down. The Badgers start the third period with 1:45 left on a power play and a 4-2 lead over the Gophers. We are underway in the third period at the Kohl Center. #Gophers still have a penalty to kill. Badgers score again, so I guess no letdown tonight. BADGERS GOAL: Trent Frederic scores on the power play to give the Badgers a 5-2 lead 57 seconds into the third. PPG, Wisconsin. #Gophers now trail 5-2. 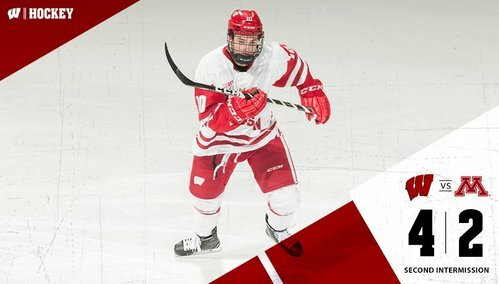 5-2 Wisconsin, 19:03 left on the Frederic power play goal. That makes the Badgers 2-for-4 on the power play. Minnesota had killed 27 straight tries entering the game. Another power play for Wisconsin and a Minnesota player sends the puck down the ice in frustration. #Gophers will head back to the PK. Notermann for tripping. Cavallini draws a tripping penalty and the Badgers will send out the power play unit. 5-2 UW with three minutes gone by in the third. Minnesota's Notermann is called for tripping. Badgers back on the PP. But the power play is quickly erased as Jurusik takes an interference minor. 4-on-4 hockey for 1:49. Jurusik evens it out, nailing Bristedt to earn a penalty. Four on four hockey for 1:49. UW's Jurusik is called for interference after setting a pick on Bristedt beside the net. 4-on-4. Rare goalie penalty. Jurusik called for interference so that will negate the penalty. 4-on-4. I'm going to need to see a replay to tell whether Jurusik's interference call was a better hit than Adam Hauser's in OT of '02 title game. #Gophers at full strength...and the Badgers now are too.